Eggleston Steel has come a long way since it was first established in 1809. Matthias Eggleston purchased the former ironmongers from Joseph E Hunt for his sons Walter and George and it is one of the longest established family businesses in Derby. Formerly known as Eggleston Brothers Ltd this East Midlands based stockholder and processor has earned an enviable reputation among its varied client’s base not only in and around the Midlands corridor, but due to their central location in the rest of the UK too. Since those early days in the town the company has seen a steady rate of development outgrowing its previous three city centre locations. It was the move to its current premises on Alfreton Road eleven years ago which has seen the company’s largest period of growth. With a £5 million increase in turnover from 2.5 million to 7.5 million during this period and an expansion in the workforce from 20 to 46 plus a further two more lorries, taking the fleet of vehicles to five. Since the move to new premises in 2003, from a unit of 15,000 square feet to 25,000 square feet the company has continued to grow and indeed outgrowing that space within two years they took on a further building adding another 10,000 square feet to the site. This unit was used to house an increased structural steel range on the general steel stockholding side of the business. In 2007 this also became the site for their first profiling machine. In 2011 it was however decided that, in terms of profiling, it was time to aim higher. At this point they decided to swap their first 6m x 2.5m machine capable of cutting up to 40mm plate for two more advanced High Definition XD Plasma machines with a much larger 13m x 4m cutting area, being on a common rail track. This combination also has attached to one of the bridges 2 gas cutting heads, allowing the possibility of cutting up to 250mm thick, meaning that they could now cut the full range of plate thicknesses from 1mm to 250mm in mild steel. The 6kw CO2 TRUMPF laser machine. Realising that space was once again going to be an issue, a further unit was required and in early 2012, working with local developer John Blount of Ivy Grove Developments, they moved the whole profiling department to the unit once occupied by Bombardier Transportation’s Wiring Division, giving them scope for future expansion with this unit being 15,000 sq feet in size. Having at this point enjoyed a successful working relationship with their regular and loyal client base they acknowledged their customers demand for having some component parts laser cut, so set out to source a reliable and reputable supplier for this type of machinery. They opted for the 6kw CO2 TRUMPF laser machine, having a larger than standard 4m x 2m cutting area. Delivered and commissioned in June 2014, this machine, along with it’s specific technology was the first type of it’s kind installed in the UK. Using the most advanced quoting and nesting software available it enables Eggleston Steel to offer greater choice and flexibility when cutting, being able to offer stainless, aluminium and mild steel cut to much tighter tolerances than before, allowing customers to receive products that may not require secondary operations, saving time and money for their clients. 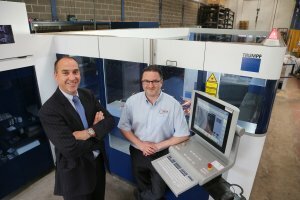 This new machine opens up further markets in automotive, rail and aerospace sectors, being able to produce finished parts making anything from signage to engine cogs. Eggleston Steel has recognised that since the recession their customers have streamlined and they increasingly need to add value. Customers are looking to stockholders to offer more and Eggleston’s have taken advantage of that. With margins on stockholding forever being squeezed the business has now become much more production driven. With clients ranging from local schools to Rolls Royce they are confident that they will be able to feed this machine. Research shows that there is a lot of competition in the local area but demand for laser cut products remains very high and due to size of Eggleston’s compared to their larger national counterparts it means they can offer greater flexibility in terms of service and delivery. Metalogic are pleased to have been a part of the growth at Eggleston’s. Before Metalogic Eggleston’s ran a bespoke software package designed by Isys computers who had been with Eggleston’s for 25 years. In 1999 it was recognised that the compliance issues of Y2K were going to cause problems with their current software and they needed to change supplier. Locally based Delta Computers offered a windows based solution called Crystal that seemed to tick all the boxes. As the millennium drew near however it became apparent that the new software would not meet Eggleston’s expectations and this was evident as the suppler soon went into liquidation, leaving the company with no supplier and only ten desk top computers to show for it. Isys Computers maintained their old software while Eggleston’s again looked for another option. Metalogic were identified as being an associate member of NASS (National Association of Steel Stockholders) who supplies software to many stockholders around the country. Having completed their own independent research Eggleston’s decided that to move forward, Metalogic were the best-fit supplier. The advantage of working with Metalogic is that Eggleston’s can be confident that they are working with people who understand the business of metal. Eggleston’s currently work with iMetalServer™ an e-commerce solution designed by Metalogic which offers a complete, fully automated, computer to computer trading solution designed specifically for metals distribution and processing and their trading partners. iMetalServer™ interfaces with a whole range of core systems and it is this interface which has helped build an efficient and competent trading platform for Eggleston’s. iMetalServer™ allows the company to automate the exchange of CAD Data, Enquiries and Quotations, Purchase Orders, Rolling Programs, Test Certificates, Sales Orders and Acknowledgements, Despatch Advices, Invoices and Statements. Eggleston’s are confident that their latest acquisition will give them the cutting edge within the region and they will continue to go from strength to strength.